The Cucurbitaceae is a medium-sized family of dicotyledenous annual flowering herbs with around 119 genera and over 800 species, mostly from warm climates. 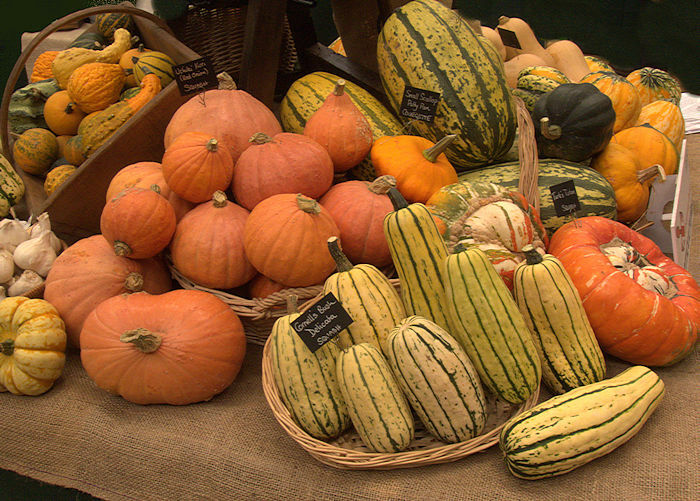 The family takes its name from the genus Cucurbita (squashes, pumpkins). Many species have 5-angled climbing or prostrate stems, often roughened with trichomes, carrying alternate, palmately 5-lobed, veined leaves and coiled tendrils. Cucurbitaceae typically have unisexual yellow or white flowers with 5-fold symmetry and pointed petals, sometimes with petals fused into a funnel, and may be monoecious or dioecious. Fruits are berries (pepo) but may be very large and bottle-shaped containing many seeds, or an explosively dehiscent capsule. A few members of the family are regarded as invasive weeds. The Cucurbitaceae includes many important food plants (cucumber, melon, pumpkin, squash) as well as useful inedible species (bottle gourds, loofah, ornamental gourds). Members of this family have been cultivated for at least 10,000 years. Some species e.g. Bryonia are also considered to have medicinal properties. Cucurbitacins (tetracyclic triterpenoids and their glycosides) occur commonly in this family and impart a bitter flavor, discouraging or even poisoning herbivores. Cucurbitacins among the most bitter substances known, have been investigated as anticancer agents, insecticides and beetle attractants. 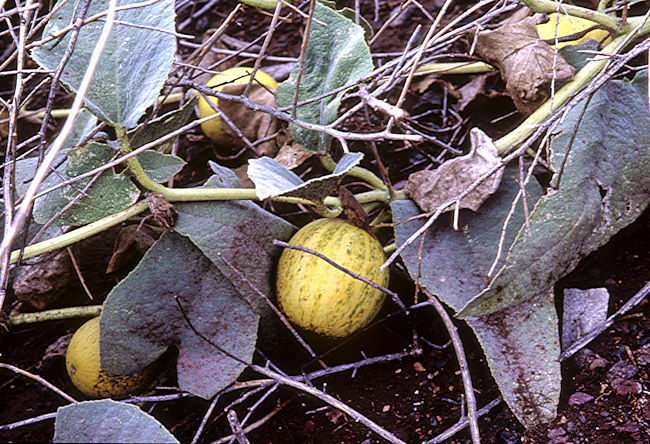 Most cultivated Cucurbitaceae have been selected to produce low levels of Cucurbitacins although the bitterness of cultivated species may increase in response to environmental stress such as heat or shortage of water. The concentration of cucurbitacins is generally highest in roots and fruit. Asian bitter melons are grown especially for this bitter flavour. 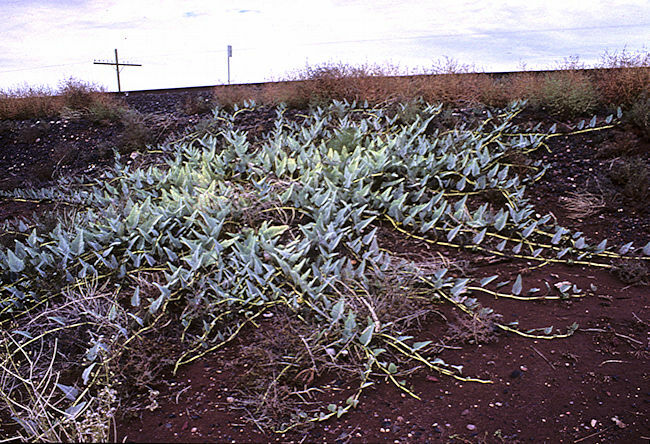 While many species have quite succulent stems and may thus be considered to have a degree of succulence, species of Coccinia, Corallocarpus, Cyclantheropsis, Gerrardanthus, Ibervillea, Kedrostis, Melothria, Momordica, Odosicyos, Seyrigia, Xerosicyos, and Zehneria are generally considered worthy of cultivation as succulent or caudiciform plants. In the interests of sanity, is advisable to introduce these plants to an individual climbing frame early on, as otherwise they may decide to explore the entire greenhouse. 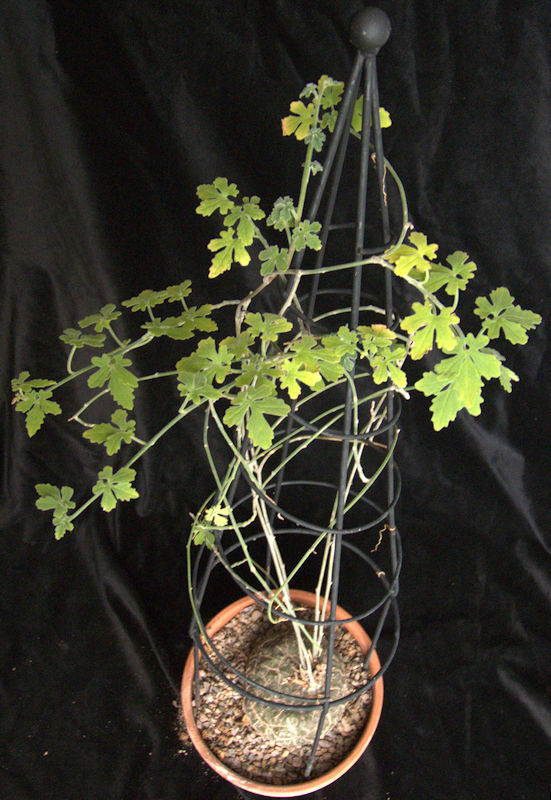 Ten to twelve species of perrennial climbing vines with thick, fleshy white succulent taproots, from England and Europe to Asia, North Africa, the Canary Islands and South Asia. The island of Crete has its own species B. cretica. 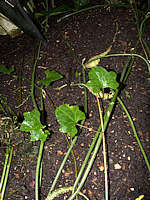 The annual vining stems with large lobed leaves, scramble through bushes and are typically found in woodland margins. Small white flowers are followed by berries containing one or two seeds. The plants are toxic especially the root, ingestion of which can cause death within hours. 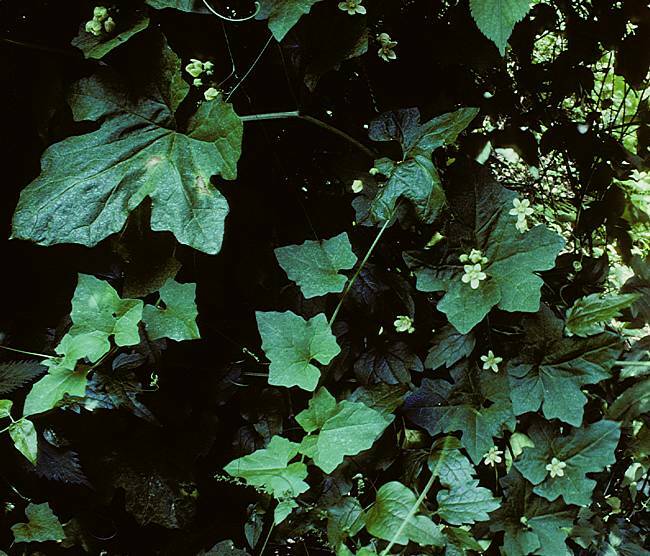 Bryony has been used as a medicinal plant for over two-thousand years and was known to Hippocrates (460-380 BC), Dioscorides (De Materia Medica 64 AD) and Pliny the Elder (Historia Naturalis ca. 77 AD). Bryonia dioica has become naturalised in the USA and New Zealand. 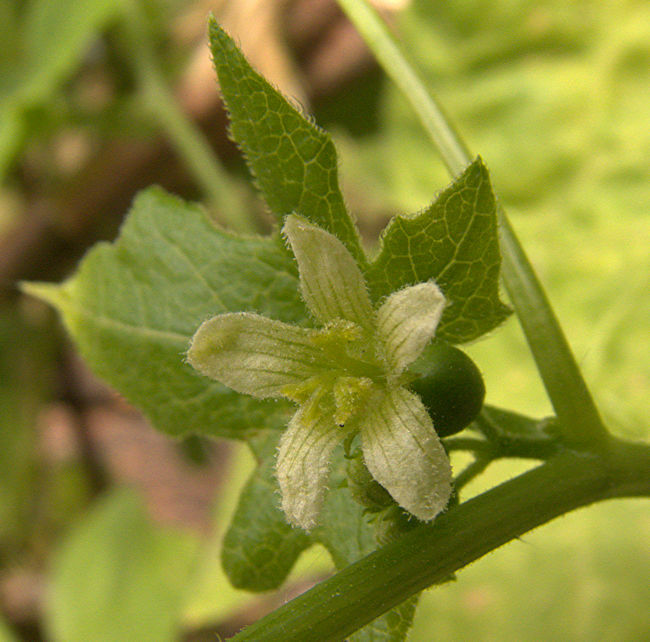 White Bryony is the only native English cucurbit. This climbing plant of hedgerows and woodland margins is found in England as far North as Yorkshire and in Europe to the Middle East. 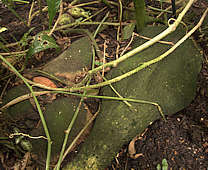 From a large forked fleshy perennial root arises a large annual vine, with an angular stem bearing alternate large simple triangular leaves with notched margins and long tendrils arising from the leaf axils. The English species Bryonia dioica has small white flowers with 5 petals, followed by red berries with a thin skin over one or two seeds. A similar European species Bryonia alba has black berries. Both male and female flowers occur on the same plant. Bryony makes an interesting hardy plant for a large pot with its own climbing frame and can be left out thoughout the winter. The tubers of White Bryony are very poisonous and contain the bitter, irritant alkaloid bryonine, useful in animal husbandry and as a medical "cure-all" including a 14th century treatment for leprosy. Modern herbal and homeopathic preparations are still in use. 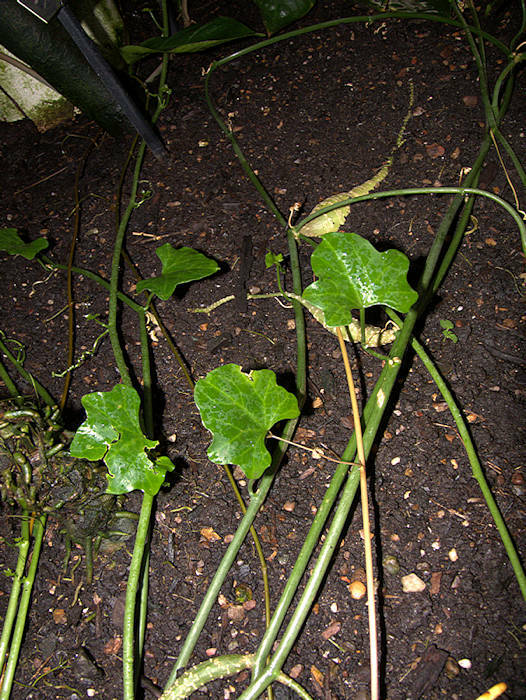 White Bryony is of historical interest as its forked root was often used as a substitute for the magical root, Mandrake (Family Solanaceae), which does not grow well in Great Britain and had to be imported from the continent. The more similar to the human form, the more valuable the root. 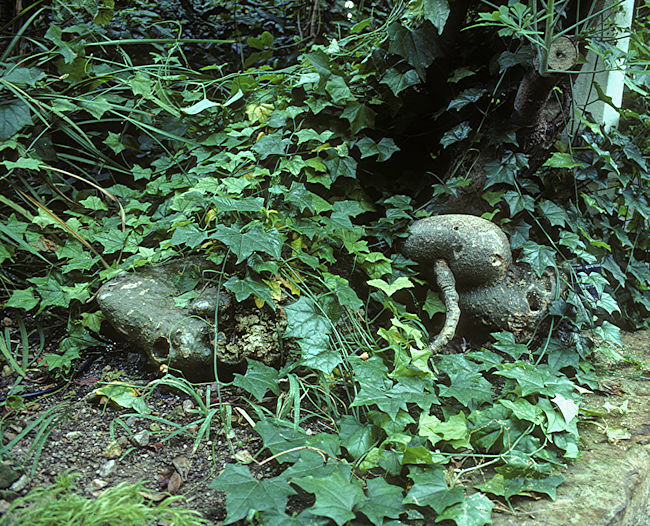 To counterfeit a Mandrake root and encourage a suitable shape, a White Bryony root was made to grow through an earthenware mould in the shape of a homunculus. 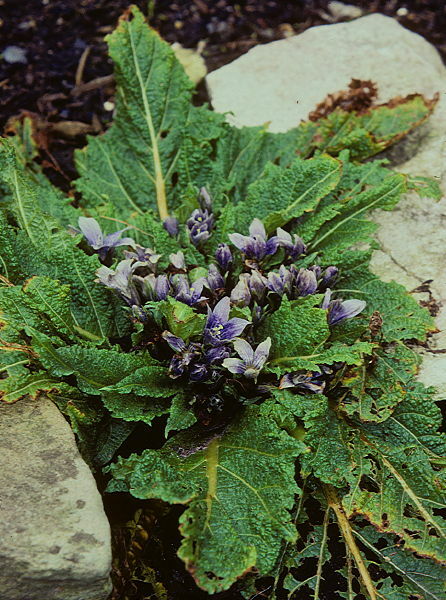 Mandrake was widely used as an anaesthetic and in childbirth. One can only imagine the consequences of substituting the root of a different species. 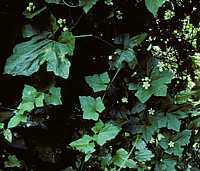 Note: the English "Black Bryony" is from the wild yam family, with different toxic and herbal properties. A genus with around 15 species of which several are commercailly important for their large fruits and protein-rich, oily seeds. These are trailing plants, prone to scramble through bushes and may be annuals or perrennial. 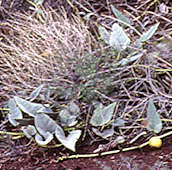 The angled succulent stems are often hairy and with tendrils. Numerous selected cultivars of C. pepo, C. maxima and C. moschata offer a variety of shapes and colours of the fruit and improved flavour compared with wild species. 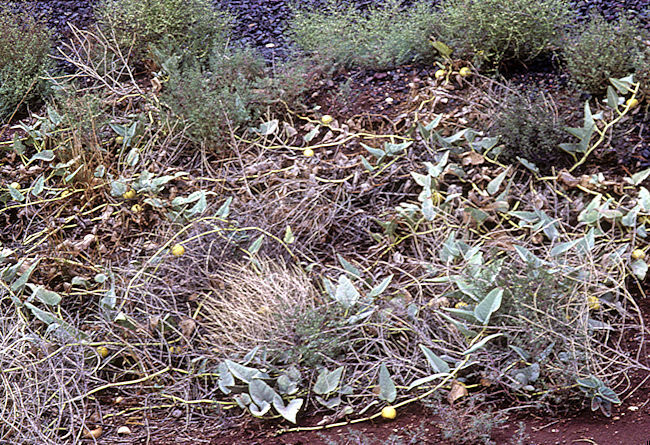 Cucurbita foetidissima (Coyote Melon, Buffalo Gourd, Calabazilla) growing between the road and the railway tracks near Marfa, Texas. The perrennial, fleshy succulent tap-root sends out many prostrate 20 ft stems with purple-green ear-like leaves reminiscent of the pointed ears of a coyote. The coarse, hairy foliage has a sweaty, fetid odour when bruised, hence the specific name. 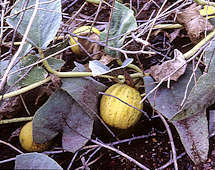 The large, yellow flowers are followed by striped gourds. The protein-rich, oily seeds within the gourds were used for food by Native Americans. Pieces of the gourd contained a soapy material for washing clothes and hair. Dried gourds were used as rattles. Five species of tuberous climbers from tropical and Southern Africa. The massive 2 ft succulent tubers produce a mass of vining foliage, scrambling over 20 ft up support wires on an adjacent pillar. Pendulous small orange flowers are followed by small angular dehiscent capsules containing six winged seeds. Native to a wide area of South Africa, Mozambique, KwaZuku-Natal and Swaziland. Named for: Pierre LeMoyne Sieur d'Iberville (1661 - 1706) explorer & founder of the French colony of Louisiana. A genus that includes 9 species of tuberous succulent perrennials from the Southern USA, Mexico and central America. The globose tubers are generally at least partly exposed on the surface. The narrow stems are perrennial or produced annually in response to seasonal rain and bear 3-5 lobed leaves, tendrils and small yellowish flowers. 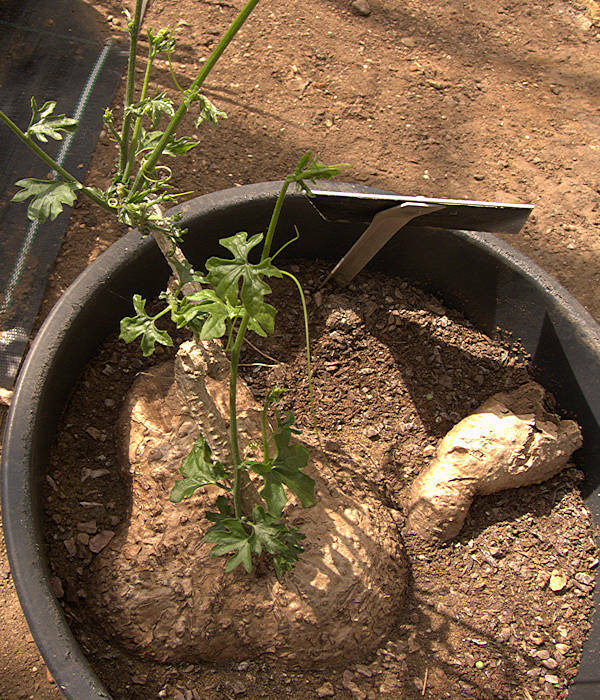 This succulent Cucurbit has a large carrot-shaped caudex lying on the surface, rooting at one end and at the other producing round lianes with small 5-lobed glossy leaves and tendrils at the stem joints. 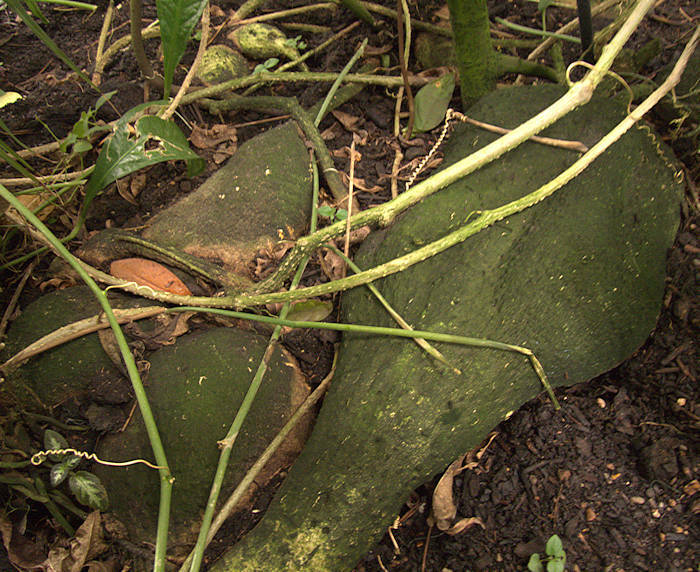 Where stem joints touch the ground, roots and additional tubers may be produced but the vine tends to scramble upwards through bushes and trees towards the light, supported by the tendrils. Native to southern Mexico and Belize. Display by Craig House Cacti at the Chelsea Flower Show 2010. This succulent plant is native to Texas to Baja California and North-East Mexico. 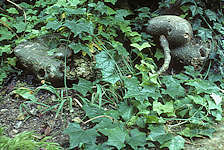 It makes a very large caudex, up to 3 ft in diameter with 10 ft of vining growth. Small yellow flowers are followed by red berries. The plant is dormant for much of the year and watering should be light until leaves emerge. A decoction of the root is a traditional Mexican remedy for hypoglycemia. 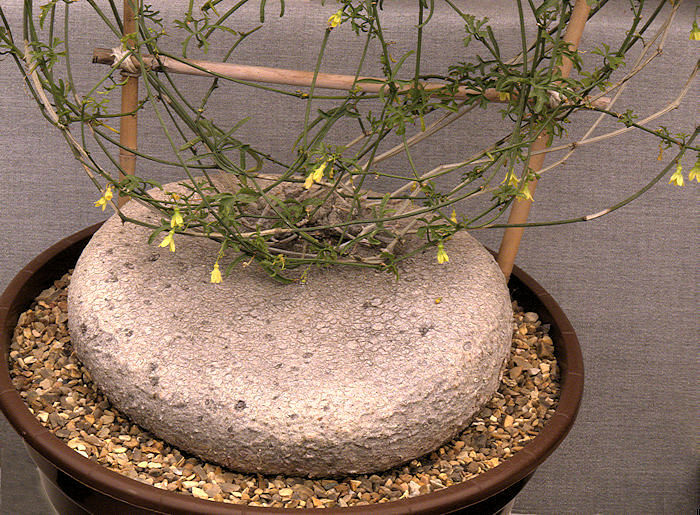 Around 35 species with many synonyms, of tuberous climbing or trailing plants and some sub-shrubs, often with succulent tubers or caudexes which can be raised above the surface for display. Most species produce small greenish-white to greenish-yellow male and female flowers on the same plant (monoecious). Native to tropical Africa, Madagascar and tropical Asia. This succulent plant is the type species for the genus. From a substantial 10 - 20 inch tuber arises a deciduous green stem with 3-5 lobed green leaves and tendrils, climbing 20 ft through bushes. 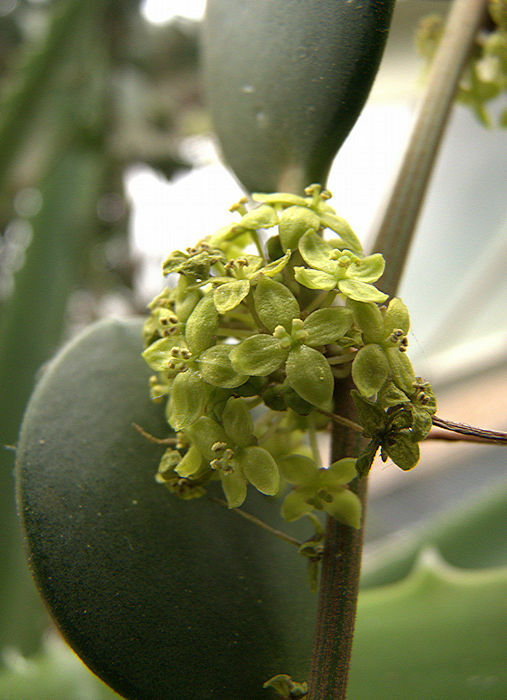 The small flowers have five greenish-yellow petals and are followed by orange berries. Native to South Africa and Namibia. In cultivation a climbing frame should be provided to keep the foliage under control. Water freely during the Summer growing period and withdraw water during the Winter when the foliage will die back. African farmers use the bark to prepare a purgative to treat livestock. This genus consists of four to six species of rather disimilar scrambling shrubby succulent plants with either succulent leaves or an above-ground caudex. All species are native to Madagascar. Princess of Wales Conservatory, RBG Kew. 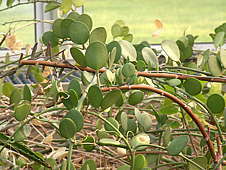 This succulent vine is the type species for the genus. 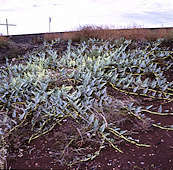 The caudex produces a shrubby mass of scrambling green-stemmed vine up to 30ft long, with rounded grey-green succulent leaves up to 2 in in diameter and long tendrils arising from leaf axils. The tiny flowers are greenish-yellow with four petals. Native to Madagascar so needs continuous warmth. 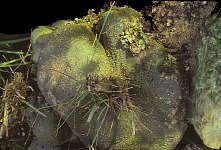 This succulent plant can be propagated from stem cuttings, but such plants do not form a caudex. To obtain a plant with a caudex, grow from seed. 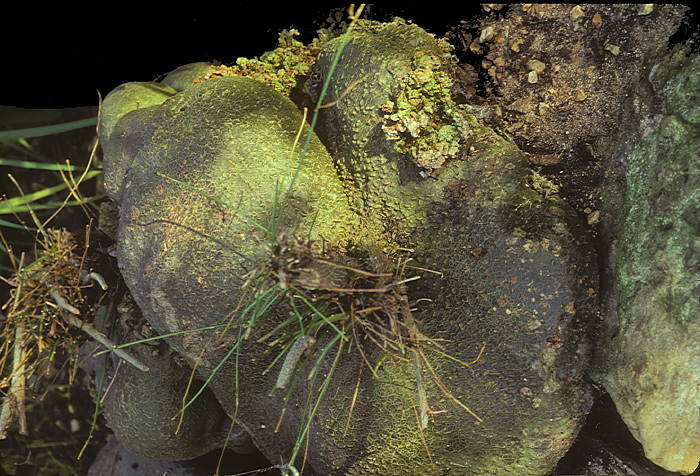 This vining plant has a large greenish flattened-spheroidal caudex, patterned with a brownish mosaic of cracks, from the apex of which arise thin angular vining stems with tendrils and small 3-lobed leaves. The caudex expands and shrinks a lot according to the amount of water it has absorbed. Flowers are small and yellowish-green. Native to mountains of Madagascar but seems happy with a cool, frost-free Winter. Needs a climbing frame to wind the stems around or it will explore the greenhouse and attach itself to other plants. 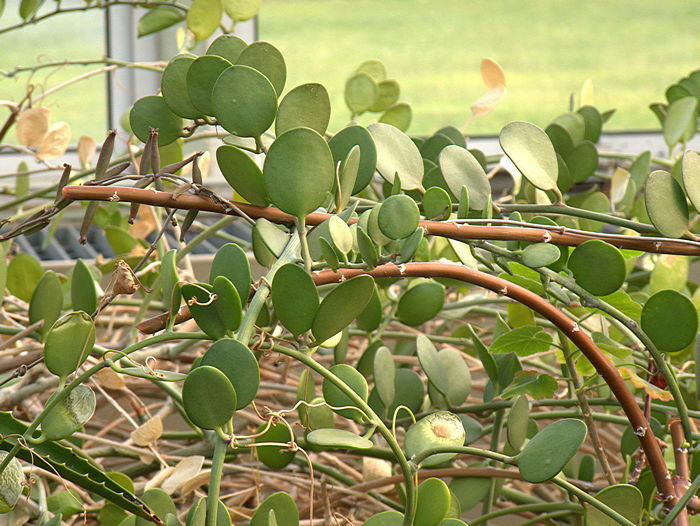 This succulent plant can be propagated from stem cuttings or from seed. Cuttings may not make a caudex. This genus genus is currently monotypic for Zygosicyos pubescens (Keraudren) G.D. Rowley 2002.